IT WAS WELL AFTER THE NOON HOUR on a Saturday. I was hungry. And we were still too many curving miles away from our destination of Pine Island in southeastern Minnesota. I needed something, anything, to settle my immediate need for food. I unzipped my purse, scrounged for two peppermint Life Savers, unwrapped them and then dropped one into my husband’s hand and popped the other into my mouth. This would tide me over until I could get real food into my empty stomach. 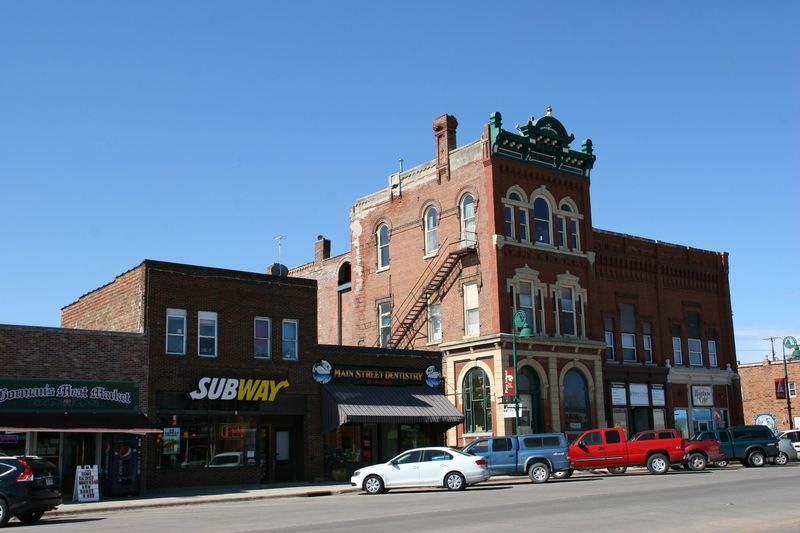 Driving along Pine Island’s busy Main Street, I notice a meat market and a Subway. I was looking for a small town cafe but was semi distracted by the historic architecture. Finally, we rolled into Pine Island from the west backroads, not from U.S. Highway 52, the crazy busy four-lane that connects St. Paul to Rochester and bypasses this rural community. 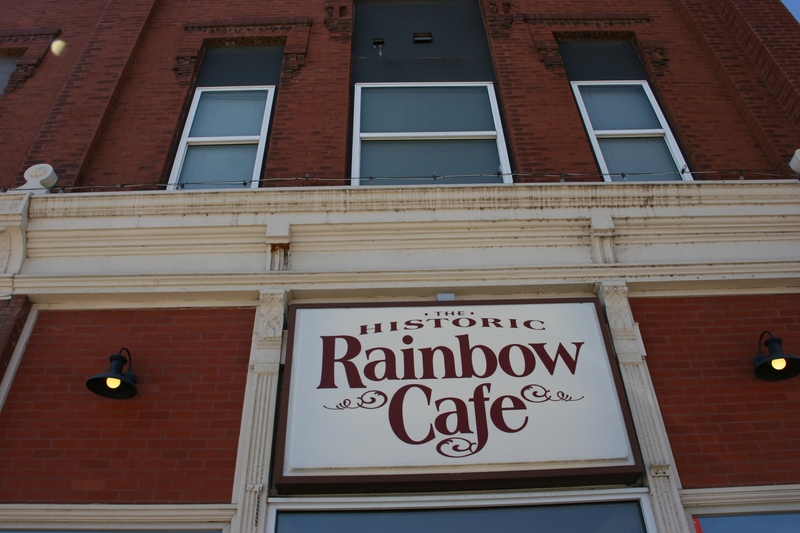 The Rainbow Cafe is among businesses housed in historic and architecturally interesting buildings. Simple and lovely signage above the front door. I like to see menus before entering an eatery. Since I don’t have a smart phone, this street side menu listing is helpful. Now, where to eat. 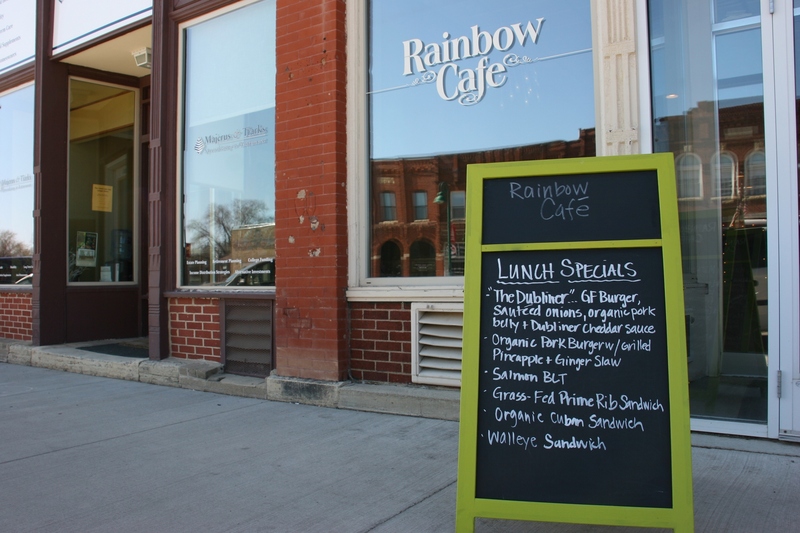 We drove through the downtown scouting for a place, finally settling on the Rainbow Cafe. The outside sandwich board advertising a variety of unique selections not typically found on small town diner menus drew me to this eatery. The Rainbow did not disappoint. I ordered the grass-fed Prime Rib Sandwich with a bowl of Cream of Artichoke Soup. 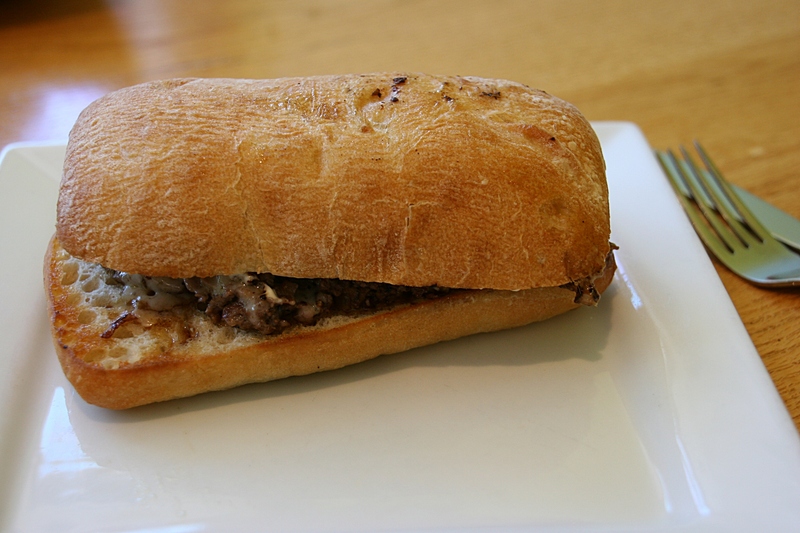 Randy chose a Cuban Pork Sandwich (with a delicious smoky taste to the meat) and fries. Both arrived promptly and piping hot. I like my food hot. And I always appreciate quick service. First I enjoyed a bowl of Cream of Artichoke Soup. 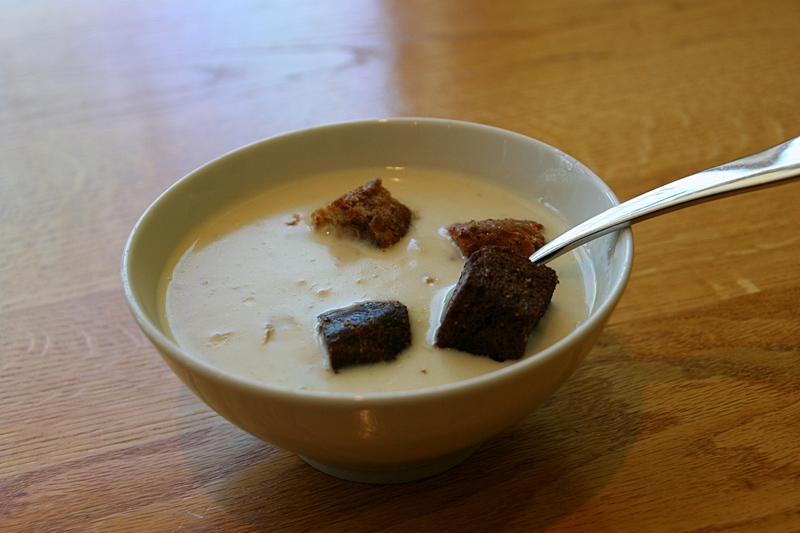 The creamy soup would have been even better, though, with additional and larger chunks of artichoke. And both Randy and I agreed that our sandwiches, although definitely savory and filling, could have done with less mayo on mine and less mustard on his. That said, I would not hesitate to return here because many menu items, like the Organic Blueberry Pork Sandwich—slow-roasted organic pork, blueberry and arugula on ciabatta—and the free-range Chicken Apple Sandwich and other lunch choices sound delectable. On the cafe’s Facebook page, I noted this recent dinner offering: Grilled pork chop with pea vine macadamia pesto, bacon and chile roasted broccoli and kohlrabi over green garlic confit mashed potatoes. 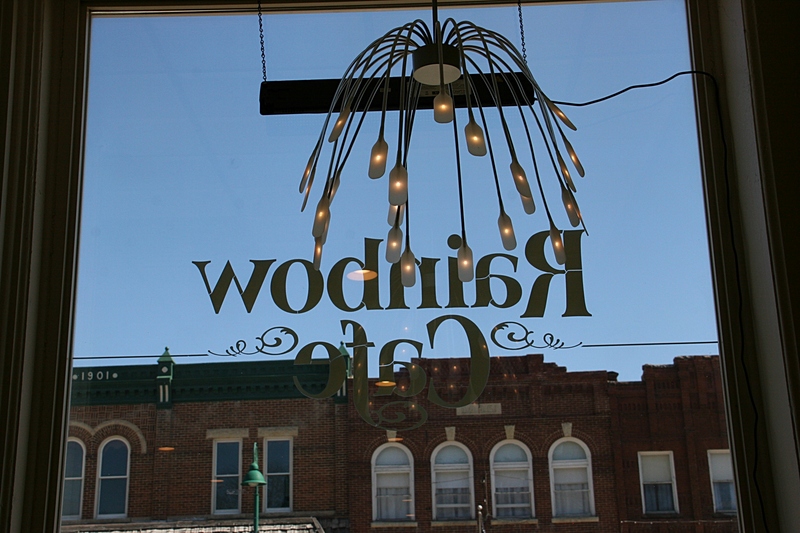 The Rainbow features locally-sourced (from places like the farmers’ market) and (sometimes) organic food with an ever-changing seasonal menu. I welcome that approach in a small town restaurant where the usual lunch offerings often lean toward your basic burgers and fries or chicken/fish sandwiches with minimal creativity. You’ll find burgers at the Rainbow. But lots more, too. Among the salad listings is a Roasted Beet Salad that I’d like to try sometime. The dessert menu and water served in a wine bottle. The waitress tempted us with a dessert list. But we were too full to indulge. Uncluttered decor with clean lines and those dangling stones define the interior. 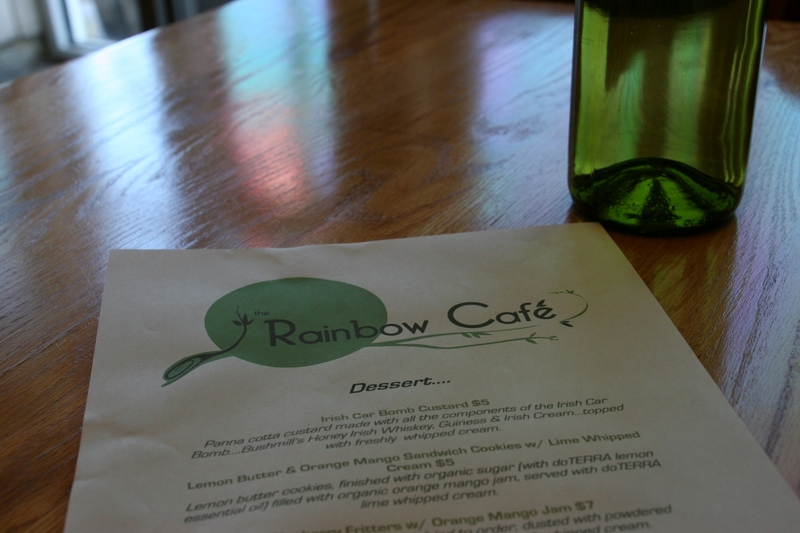 Besides the appeal of creative and tasty food choices, the Rainbow Cafe presents a soothing environment in which to dine. Granted, we ate there at past peak meal time. 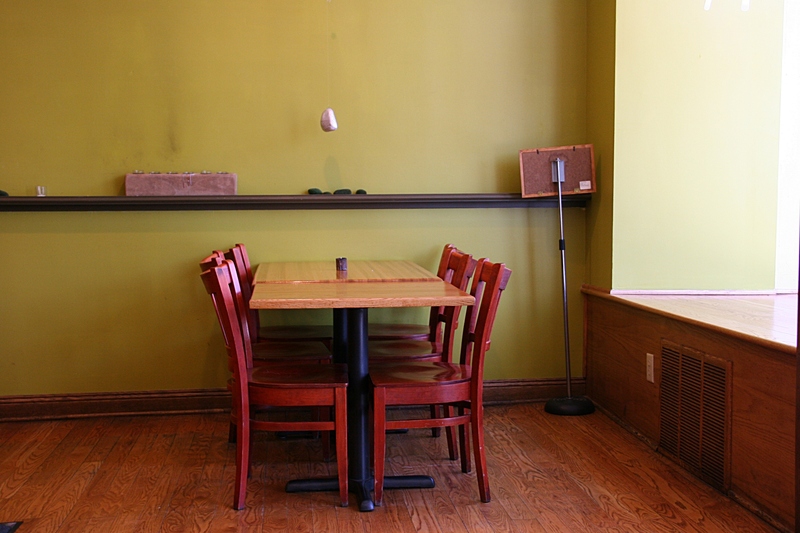 But I think even at its busiest times, diners would feel comfortably relaxed in this minimalist setting. Randy and I were a bit curious about the stones dangling from the ceiling beside tables. I forgot to inquire. My guess: They are related to the concept of Fen Shui. From my seat, I had a good view of beautiful historic buildings and Main Street. We purposely seated ourselves next to a front window, for the light as much as the view of Pine Island’s Main Street which sees a steady flow of traffic. Cross carefully. We did exactly that after finishing our sandwiches and setting out to explore this town of some 3,300 only 18 miles from Rochester. 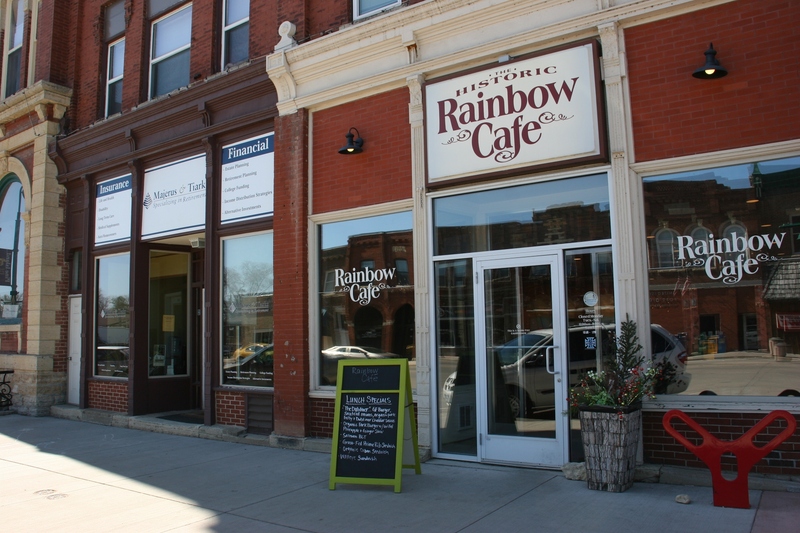 FYI: The Rainbow Cafe, 212 South Main Street, is open 11 a.m. – 8 p.m. Tuesday – Saturday; from 10 a.m. to 1 p.m. for Sunday brunch; and is closed on Mondays. This post is based on our dining experience in May. 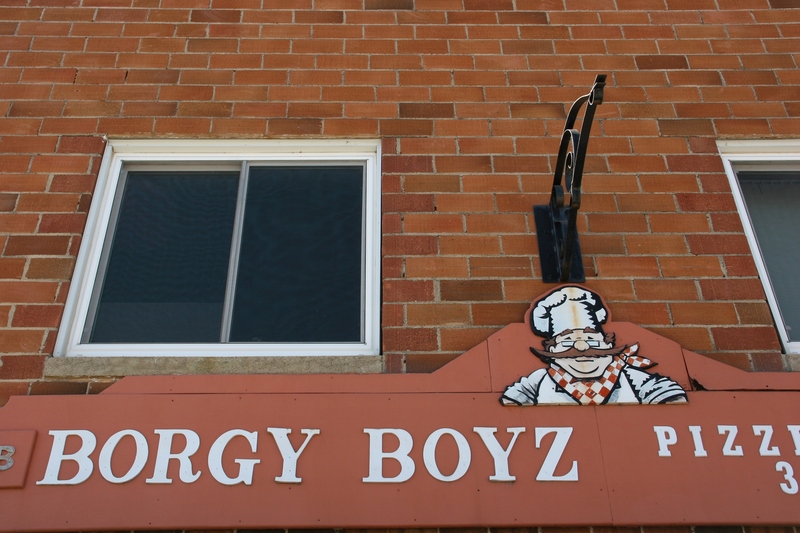 Borgy Boyz appears to be a popular pizza place which also serves wraps, salads, sandwiches and more. I really like this signage. I’d like to know the history behind the name. On a few drive through along Main Street, I saw a number of folks hanging out outside this sports bar. I don’t care for sports bars, so did not consider this a dining option. It seemed a popular place, though. 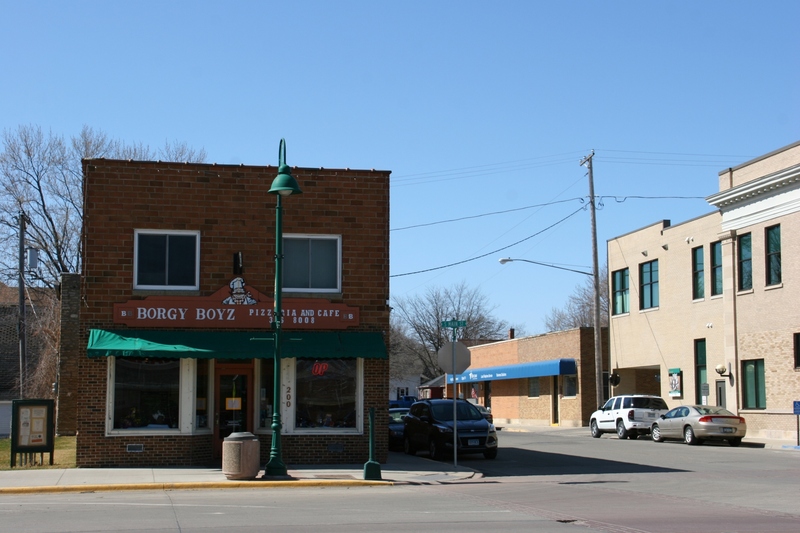 Because I know everyone has different tastes, such as a Wisconsin resident who didn’t find cheese curds at the Rainbow Cafe (so our waitress shared), there are plenty of other options like Borgy Boyz Pizzeria & Cafe, which looked busy; the Pine Island Sports Bar; Cathy’s Catering and Cafe; and Better Brew Coffeehouse. I’m sure I missed a few places. The Rainbow Cafe serves mozzarella sticks. Not quite Wisconsin cheese curds. But then this isn’t Wisconsin. 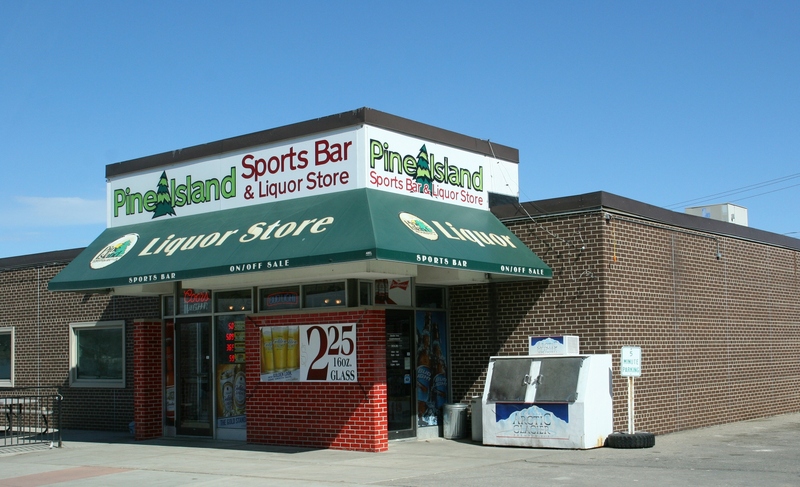 FYI: If you missed my first post on Pine Island, click here to learn more about this southeastern Minnesota community. Viroqua, near La Crosse, right? Right! South of La Crosse on Hwy 61. Lots of antique shops, great tourist shops, architecture, The Driftless AND a quilt shop (the Quilt Basket), BTW!!!!! LOL!!!!!! Oh, imagine that, a quilt shop. No cheese curds… That might be a deal breaker. Your sandwich looked amazing and as usual the photos of the historic buildings are stunning. Thanks for sharing. That’s right. You LOVE cheese curds. Yesterday we resumed my wife’s quest to visit every quilt shop in Northeastern Iowa. It’s fun to visit small towns that are beyond a casual drive to a major city. In Greene Iowa, we visited Dralles Department Store, which is just as it’s name implies, an old time department store. We didn’t stop to eat…after reading this, I will plan leave the house hungry for the next trip. What a wonderful adventure you are on through Iowa. I would love to visit an old-time department store. Oh, yes, leave the house hungry. Off the beaten path so to speak, Pine Island has a variety of eateries. I’m especially impressed with the upscale menu of the Rainbow cafe. My thoughts precisely on the Rainbow Cafe. Pine Island is near Rochester, a major Minnesota city, and I expect many diners are from there. We get only your basic TV channels from a roof antenna, so I’m not familiar with Guy. But I trust you know of what you write. Thank you Audrey. He travels around the country trying out places, his show is called “Diners, Drive ins and Dives” and it features and eclectic array of eateries. The Rainbow Cafe would be perfect for the show. That sounds like a really good show. Excellent. We love visitors here Up North. We love going from Owatonna to Pine Island via the back roads – very pretty drive. You’re right. It is a beautiful, winding drive along the river. Happy to hear you also endorse the Rainbow, and the bike trail. The Life Savor got me through. You would have loved the Rainbow, Charlie. Looks like a great place to eat and I love the building it is housed in. I feel good vibes coming from it. You would like the Rainbow, Beth Ann.